Life has been a lil sour for me lately and I feel the need to vent a bit about it now. Monday night my hot water heater broke. It flooded my apartment. It was not a pleasant thing to wake up to. 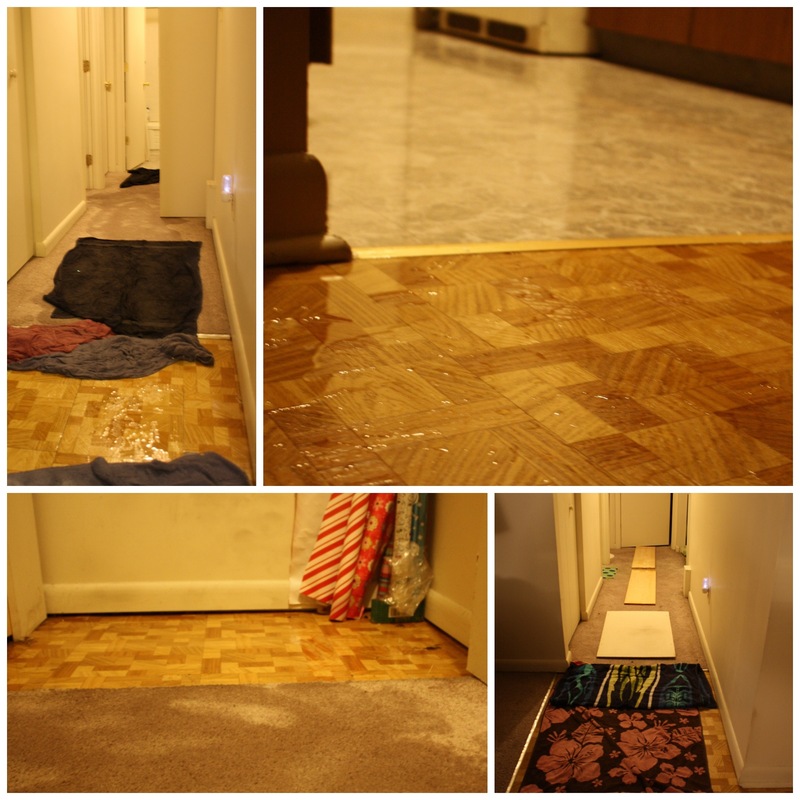 Our carpets were drenched and our closets were full of water and now damaged goods. A maintenance man came right away to turn off the water and run the shop-vac twice. This is what it looked like after the first attempts to clean it up. They left around 1:30am and told us to remove everything from the kitchen for their return in the morning. And so we did, filling my living room with all of the dishes, drawers, etc.. from the kitchen. We took a 2 hour nap between the preparation for their return and their actual return and then my apartment was in full repair mode. A lady showed up with a different shop-vac, one that also shampooed the carpet. She ran it three times and it was still wet. She left a giant turbo fan aimed at it and left. My dad is very ill. And we don’t know why yet. It started the week before last, when he got some freak eye infection after fish splattered in his eye. His eye swelled up so big it was like there was a golf ball trapped inside his eyelid and he couldn’t see at all. Apparently it’s so serious some people go blind from it. So they put him on two really strong antibiotics and sent him on his way. But in the middle of the night he was rushed to the hospital because he couldn’t breathe. Turns out he was having an adverse reaction to one of the antibiotics so they took him off of them, pumped him full of steroids and sent him home again on something new. Within a few days his eye started fading back to its normal self. But then, this past Sunday, he was in such excruciating pain he thought he was having a heart attack and had to leave church in the middle of service. While he wasn’t having a heart attack (thank God), his liver was severely inflamed and he could hardly move. Thus began a series of tests. Blood tests, pulmonary tests, cat scans, tests-tests-tests. So far all we know is that the blood work indicates one of the four following things: heart disease, liver disease, kidney disease, or a bleeding ulcer. None of which are good things. My dad is only 51. He seems way too young to be facing these complications already. And I have to admit I’m scared for him, because three of those four possibilities can take your life, at any time. I can’t imagine what it’d be like to lose my dad so early in life. I don’t want to. So in conclusion, trouble came knocking at my door when my heart has already been weary. If you’re the praying type, please say some prayers for my dad. Some hopeful thoughts would work too, though. Thanks in advance.